Do you love Halloween? If so, then it’s time to start decorating! Whether you’re inviting in trick-or-treaters or you’re throwing a Halloween bash, your front yard will give people their first impression of your Halloween spirit. If you have uplighting, you can create spooky shadows in your yard. Placing small ghost cutouts or other spooky shapes near the uplights will cause large, looming shadows to appear on your home’s exterior or other surfaces on your property. If you have lamps attached to your house, you can turn them into lit-up jack-o-lanterns. To do so, start by purchasing a jack-o-lantern bucket that’s intended for trick-or-treaters. Cut a hole in the back that’s just large enough to fit over the lamp (but make sure to leave the bottom of the container intact). If you want to, you can even cut out the eye and nose holes on the jack-o-lantern. Once you’ve cut the holes, simply slide the lantern over your exterior lamp and it will light up. Even if you don’t cut out the face holes, the jack-o-lantern material will be thin enough that the lantern will illuminate. Use an adhesive to attach the jack-o-lantern to the wall. While a gas lamp may create a neat flickering effect, you should be cautious about putting anything over a gas lamp as it is a fire hazard; this decoration works best over an electric lamp. It’s especially safe when you have LED bulbs in your exterior lights since these bulbs don’t run nearly as hot as incandescents or fluorescents. Floodlights are great for security lighting, but they can also help to light up your decorations. Placing decorations such as tombstones in front of your floodlights can help visitors see the decorations better. 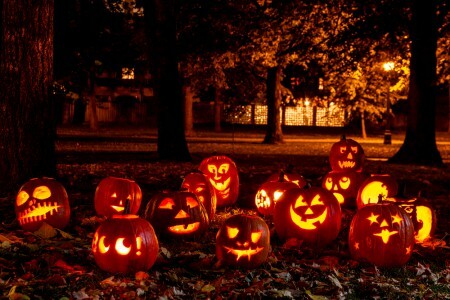 In addition, floodlights can cast a spooky glow on your decorations. For this spooky lighting addition, you’ll only need a white string of LED Christmas lights, ping-pong balls, and some colored markers. First, draw some pupils on the ping pong balls to turn them into creepy eyeballs. Next, cut a small hole in the top of each ping pong ball and slide them over the light bulbs. Now you have a string of eyeballs that will stare at all who pass by. You can place these anywhere on your home’s exterior. Jack-o-Lanterns are often lit with candles and stand in solitary. But there’s a way to make Jack-o-Lanterns even spookier without the need for dangerous flames near your home. Again, you’ll need a string of Christmas lights for this project. To create your Jack-o-Lanterns, you’ll want to carve from the bottom instead of the top. Cut out faces or other spooky shapes. It’s best to use smaller pumpkins and use a lot of them. Set the Christmas lights along a pathway or another place you want to spookify. It’s best to use high-wattage LED lights for this project. Place the pumpkins over the lights, and you’ll have flameless Jack-o-Lanterns that shine very bright. If you don’t yet have exterior lighting to guide your guests to the door or to incorporate into your Halloween decorations, contact Enhanced Outdoor Lighting & Design. 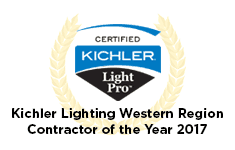 Their team can add lighting that highlights your home’s exterior and make walking around your home much safer. Contact them today before Halloween arrives.